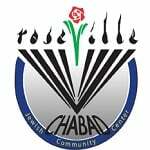 High Holiday Reservations - Chabad of Placer County, Where every Jew is Family! Participation in all High Holiday programs is free. Consider a donation to help cover the costs of these and other wonderful and vital programs that Chabad House JCC brings to our community.